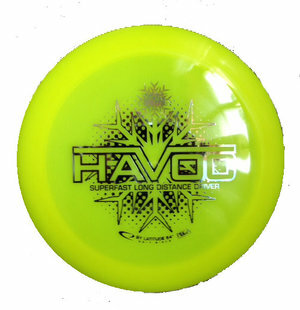 Havoc is a high speed driver that will give you the distance you need on the course. It flies very fast and seems to never slow down. It's quite easy to throw and will fit advanced and pro players. Frost Line is Latitude 64's newest addition to their high quality lines of plastic. They have worked hard to develop a plastic that feels good in the hand, has flexibility, durability, and maintains its shape in all conditions. Frost Line is very similar to their Opto Line, but with a higher flexibility and stickier grip. Creating a plastic that is flexible yet durable was a challenge that their mad scientists in Sweden have now conquered. Frost will maintain its shape in cold weather and doesn't melt in your hand on a sunny day.